1896. "U.S.S. Maine -- berth deck cooks." And their feline mascot. 8x10 inch glass negative by Edward H. Hart, Detroit Publishing Co. View full size. Submitted by Charley Noble on Tue, 04/09/2013 - 3:39pm. 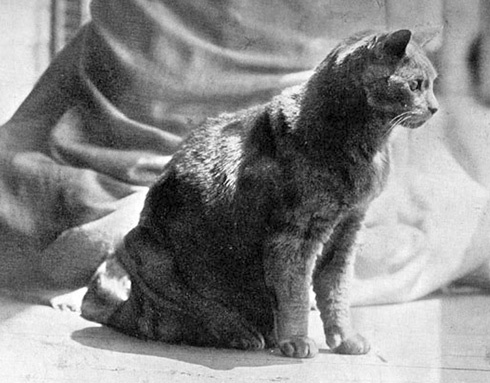 The name of the tabby cat mascot of the Battleship USS Maine was of course "Tom." Tom survived the sinking of the Maine, was found the next day somewhat singed but recovered fully. Attached is a portrait of Tom. Submitted by loribl on Sun, 09/23/2012 - 5:46pm. The toughest looking guy there...is holding the kitty. Awww, he's a real marshmallow underneath that gruff exterior! Submitted by Nitrohemi on Fri, 09/21/2012 - 8:24am. 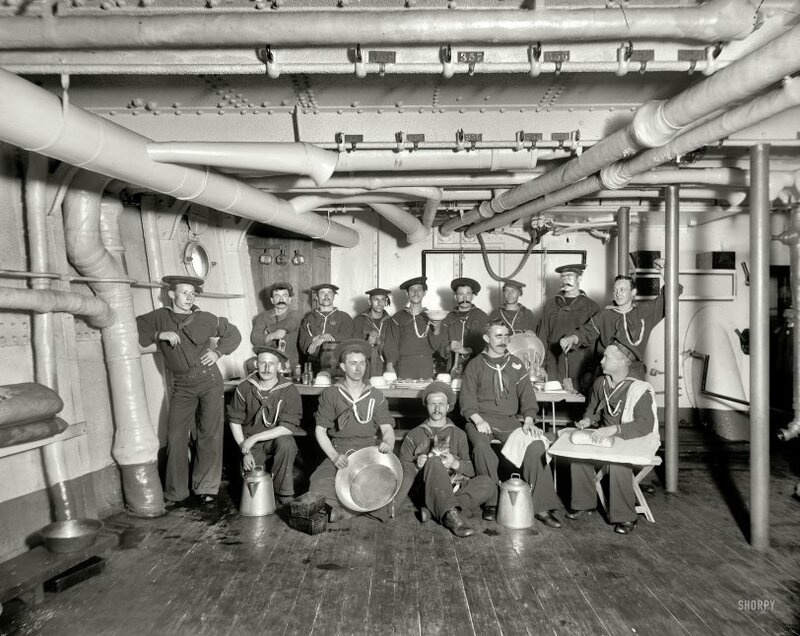 The sailor in the front holding the large round pan and the bare - headed man behind the coffee pot seem to be wearing loafers. Submitted by mbennett on Fri, 09/21/2012 - 6:23am. whattheheck are all those lanyards? Bosun's mates carried their pipes like that--attached to a lanyard and the pipe in the pocket. But these aren't bosuns. And hard as it is to believe the 13-buttons trousers were still standard issue into the 60s. "Don't call them them pants, sailor. Girls wear pants!" Submitted by Brent on Thu, 09/20/2012 - 8:49pm. These fellows would never have past muster in the Royal Navy of the period (and probably not today either). Regulations for facial hair - for all ranks - required a "full set" of mustache and beard if someone were to go unshaven. By comparison Army regulations prohibited beards except for Pioneer units (where a very full untrimmed beard was pretty much required) and certain religious groups (such as Sikhs) who received exemptions. The same regulations were retained int he Canadian military until the Unification of the late 1960s and early '70s when it was determined that if all commands would allow mustaches and beards except when safety was compromised. Submitted by rivlax on Thu, 09/20/2012 - 11:28am. Wonder if this was the officers' mess or did your rank-and-file swabby rate fancy crystal cruet sets like those on the table. Submitted by noelani on Thu, 09/20/2012 - 9:38am. As a baker of bread for nearly four decades, now, the bread pans caught my eye, immediately. I was just thinking about how deep they look and imagining how high the bread would have risen in them, when I noticed the loaf of bread on the other side of the photo. Now, I wonder what went wrong. Did someone not let it rise long enough, in a hurry to have a fresh loaf of some kind, for the picture? Did they put too little dough in the pan? Or, perhaps, they did like I remember my mother-in-law doing and go off and forget about it, causing it to rise too high and then fall. Of those possibilities, the latter would result in the worst bread! Submitted by Charlie R on Wed, 09/19/2012 - 7:44pm. When I was in, in 1963 to 1969, you didn't tuck your jumper into your pants so you didn't see the buttons. I buttoned only the two top outer buttons, to take care of business you needed to un button only one button on one side.The only time you could have facial hair was when you were overseas. Submitted by downbythecreek on Wed, 09/19/2012 - 5:31pm. What an impressive array of mustaches! It's difficult to decide which of the two handlebars in the back row is my favorite. Submitted by Klapauzius on Wed, 09/19/2012 - 4:01pm. Were, I think, correctly identified as fire grenades. Submitted by Maniak Productions on Wed, 09/19/2012 - 12:07pm. Are those fire grenades mounted on the wall at the back? Submitted by Harvey in Fla on Wed, 09/19/2012 - 8:58am. I recall my dad, a WWII Navy vet, telling me of the process they used to break-in those buttonholes - repetitive buttoning and unbuttoning until they'd open somewhat easily. Submitted by Maeby on Wed, 09/19/2012 - 7:56am. I wonder what they used for kitty litter on the ship? Most were probably dead two years later, of course. Submitted by RGMBill on Wed, 09/19/2012 - 6:07am. Interesting to see how archaic the ship looks in comparison to modern warships, yet how advanced it would be compared to warships of just thirty years or so earllier. If I didn't KNOW that the ship was destroyed killing most of the crew (at a time when the crew itself could sometimes stay on the same ship from commisioning to disposal), I would swear I see three time traveling sailors in this group: the cook holding the bowl in the back row, the cook with the coffee pot, and the cook with the bowl in the front row (minus the mustaches) all look very much like specific sailors that I've known with in my career working for the Navy. I guess it's the old Ringo Starr looks like Yasser Arafat effect, but they are ringers. Submitted by fanhead on Wed, 09/19/2012 - 5:16am. over 60 know what I mean.